Rings with Gemstones | Order Online at Rocks & Co.
Ladies Rings are wonderful things, especially when designed using natural gemstones. These natural beauties are rare, valuable and just feel great to wear. Emeralds and Rubies are divine, and Diamonds are a girl's best friend but some of us modern ladies have fallen in love with the likes of Amethyst, Citrine, Topaz, Sapphire, Morganite, Moonstone, and the wonderful lesser-knowns, like Tanzanite. Each gemstone has a mineralogical story to tell. We set these wonders in our gorgeous Silver and Gold ring settings, which is a match made in heaven and all are available online! Ladies rings should be as amazing as the ladies who wear them. And there are so many reasons and ways to wear these delicious ornaments. There are of course the traditional rings, most notably the engagement and Wedding ring. The engagement ring has a big responsibility! To represent love, commitment, a spiritual bonding, and well, the promise of marriage! You better put a Moonstone or Morganite ring on it! The rules of and for weddings and engagements are changing and so are the rings that go along with them. Fortunately for us prices are changing as well. Engagement rings are traditionally thought of as being made exclusively with a larger Diamond, the royals’ affection for Blue Sapphire, Padparadscha Sapphire, Emeralds and Rubies, notwithstanding. In truth the Diamond engagement ring "tradition" is actually rooted in a simple marketing campaign that was launched by DeBeers in the 1930s. In reality, the sky is the limit when choosing gemstone engagement rings and styles. The only rule is that they are beautiful and special in some way. Engagement rings have played a powerful role in our collective psyche. Those blessed with deep pockets and status can enjoy a pricier jewel. Others need to keep it beautiful but simple. Who hasn't seen some romantic comedy with the poor hero hurriedly creating a ring out of a straw or piece of string, or some other poverty inspired creation? In this classic storyline, the impromptu ring was still loved because of the sheer brave act of being a fool for love! But in the happy ending, the hero finds the means to bring his or her ladylove a REAL gemstone ring. Gemstones and romance go hand in hand. They always have and they always will. 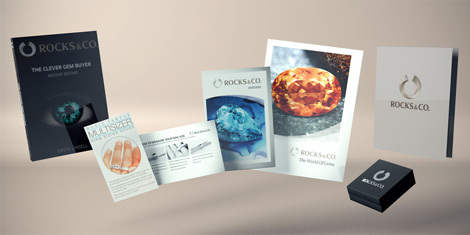 Rocks and Co. provide that dream for those of us with more modest pockets. With our natural genuine gemstones and stunningly created settings, a girl can feel like a fairy princess without putting her partner in the poor-house. We pride ourselves on affordable ladies rings in all categories. Some gals are happy to be single or not formally bound. Others simply like to give and receive a ring as a token of friendship. Others like to collect rings like Imelda Marcos collected shoes! The common thread is enjoying the glorious celebration of their life and beauty through ornament! Which brings us to special occasion and everyday rings. These wearables are so much more valued when created with precious metals and gemstones like Aquamarine, Turquoise, Citrine, Opals; Sphene and so much more. Girlz are buying their own bling and loving it! These baubles are and have been the fashion armor of likes of Marilyn Monroe, Lena Horne, and Hedy Lamar to our modern goddesses Beyoncé; Lady Gaga, Madonna, Rita Ora and Rhianna. These eye-catching rings usually feature creative combinations of stones, with natural gems including Apatite, Aquamarine, Diamond, Emerald, Garnet, Opal, Sapphire, Tourmaline, Zircon and many more, combined with precious metals of sterling silver or gold created in a fun and artful style. Cocktail rings date back to the 1920s prohibition era and the emancipated flappers participated in the underground speakeasies sporting the bling. It is also said some self-made old Hollywood female icons wore this style of rings as status symbols and celebration of their power. Power ladies and their favorite designers have long been an important relationship. But this is the era where we all not only want to coo over the fabulous treasures-we want them too! And can have them. Creativity is the new black and style is the one way that everyone can be creative. No matter what walk of life, you can make a fashion statement by being creative. Rocks & Co. make it affordable to have a Black Pearl ring for the day and a Tanzanite cocktail ring for the office party or art opening. Rocks & Co. features rings in sizes H through Z. In some cases, our customers jump over to the men's store for larger sizes and are quite happy indeed. This helps the ladies out who might want to try the thumb ring trend out for example.